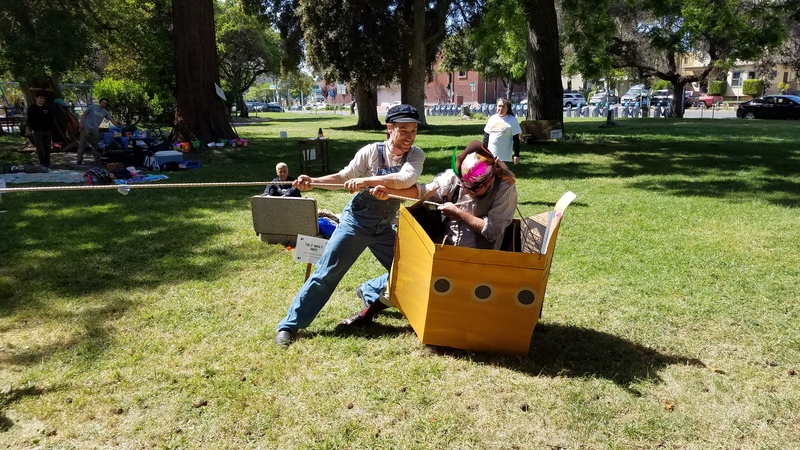 Our summer tour of Shiver We Timbers! closed on August 12. It was a swashbuckling adventure to be sure, full of pleasures and perils. 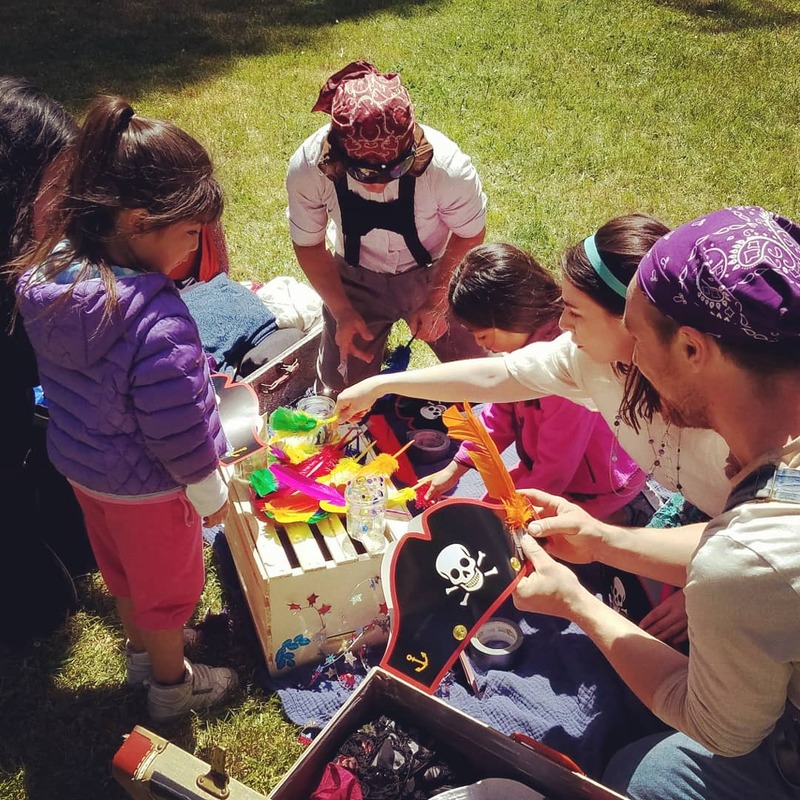 With your help, we found the lost treasure of Penelope Pandulce Potrero (the Pirate Princess of Pangea), and we made lots of new friends and reconnected with old ones — over 1000 of you came to see us this summer! Every adventure was a bit different — because you picked it! On our voyages, we explored uncharted isles, encountered “graceful” mermaids and dancing undersea creatures, were cursed by sea magic, escaped scrapes in the mythical pirate port of Puerto Peruguano, met our doom aboard a scurvy ship, were dragged to the depths by the Kraken, collided with an iceberg, were rammed by an enemy ship, and even came under attack from small pirates wielding paper cannon balls. But never once were we struck by lightning! What luck. Thumper and Samuel Peaches take a turn as singing Mermaids. (Joan Howard and Casey Robbins.) Photo by Soren Santos. 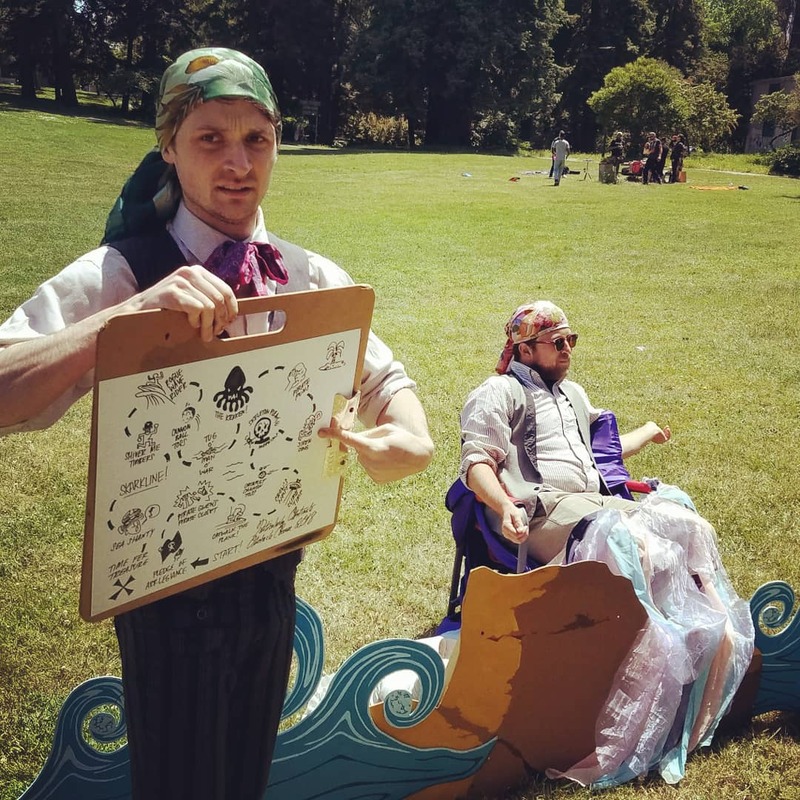 Meekins (Sam Bertken), Madame D. (Rebecca Longworth), Thumper (Joan Howard), Guy Hank (Paul Collins) and Princess Gwen (Marlene Yarosh) consult a treasure map. Photo by Soren Santos. A sea storm hits the Good Ship Peripatetic! Photo by Soren Santos. 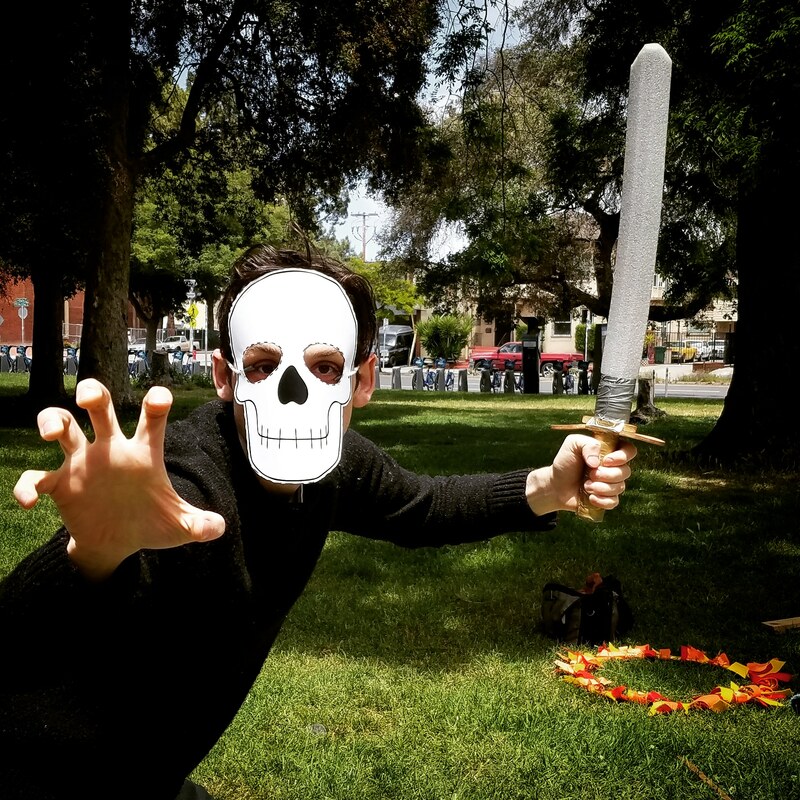 As always, the best part — and, it turns out, the treasure itself — is connecting with you, our audiences. 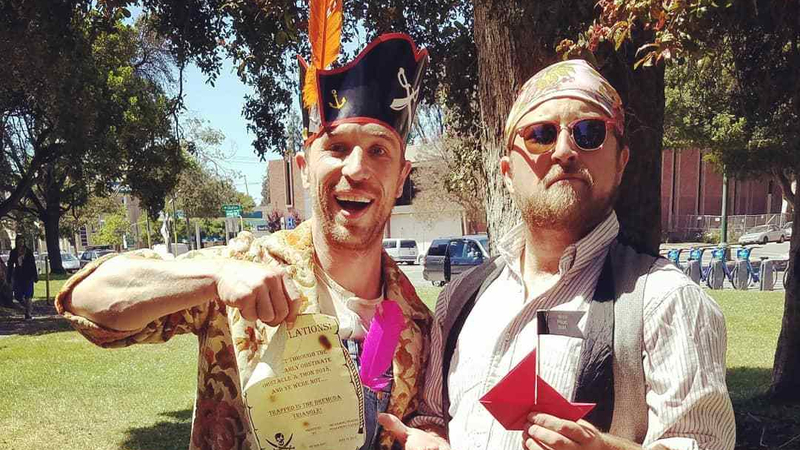 We were especially thrilled to see you dressed up in your most piratical costumes! 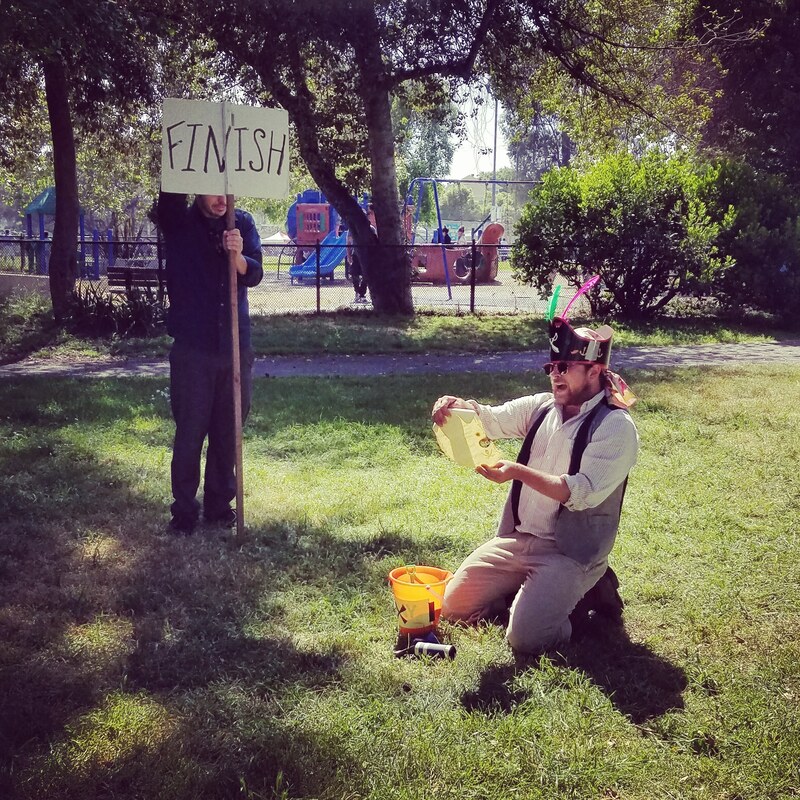 You came out to your local parks with your littlest family members and your wisest, and even some furry friends as well, and we hope you were delighted by our show. THANK YOU! We look forward to seeing you again soon! Between now and our next summer tour, keep an eye out for special events, one-off performances, and workshops! Today we’re bringing you some treats from our resident illustrator, Mr. Meekins’ very good friend, Sam Bertken. Sam has been making illustrations for our shows since the very first one, O Best Beloved, before the Peripatetic Players even knew how to peripatet. 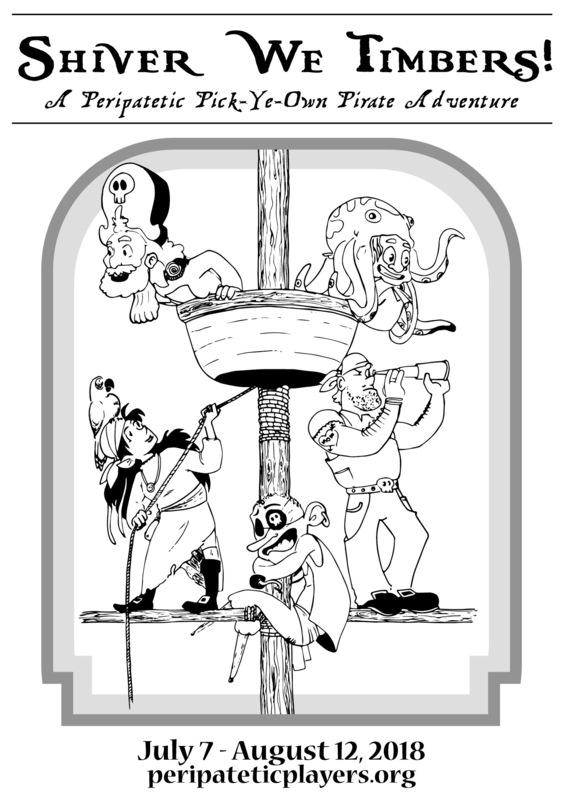 And this year, he’s drawn the pirate Players mid-adventure aboard their ship! Click the image to download a coloring page of your very own! …here’s how we colored it in for our poster! There are just FOUR MORE PERFORMANCES of Shiver We Timbers… click here to see the full schedule! 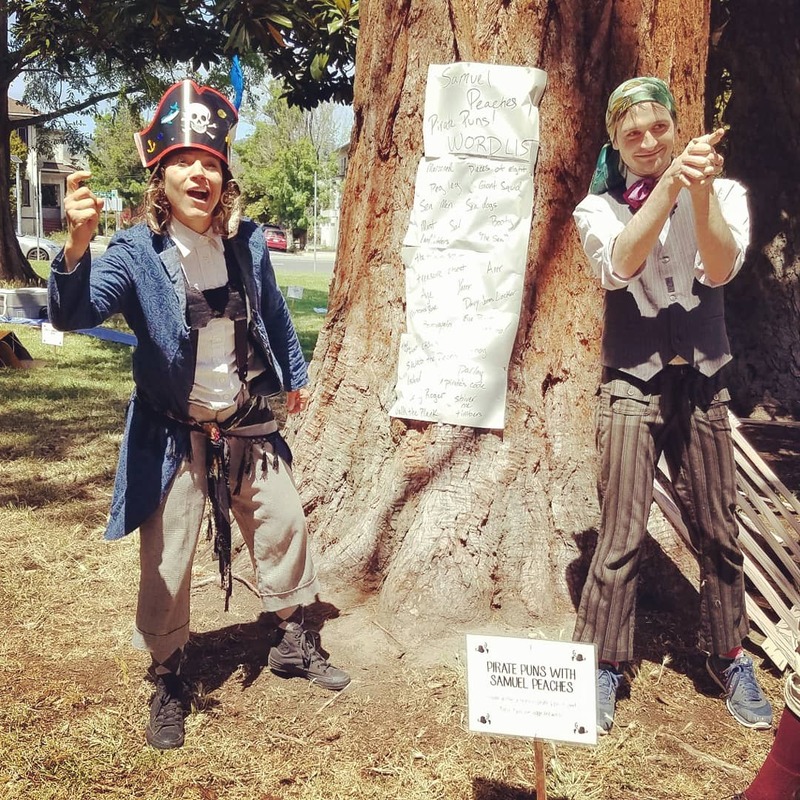 Shiver We Timbers – this weekend! Ahoy, thar! 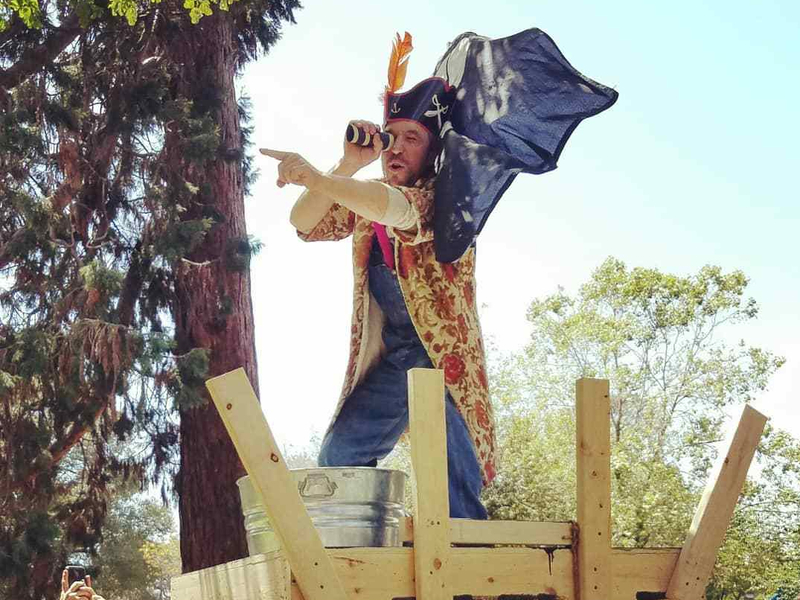 Hope yer keepin’ a weather eye out for pirates… because Shiver We Timbers opens this weekend! A clickable schedule is here. As always, Peripatetic Players shows are FREE to all! If you can donate some of your hard-earned doubloons, that helps keep us afloat. And right now, your doubloons are worth double! 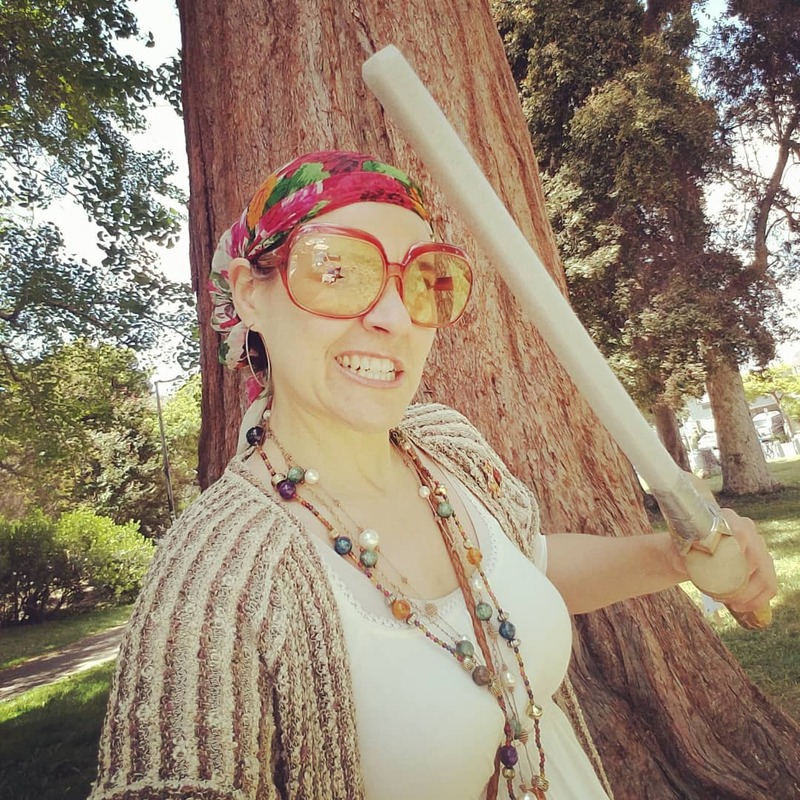 Make a donation by July 15, and your dollars will be matched by the East Bay Fund for Artists to help create a new show in Port Costa next spring. Follow us on Twitter or Instagram to get a pirate’s-eye glimpse of our voyage! 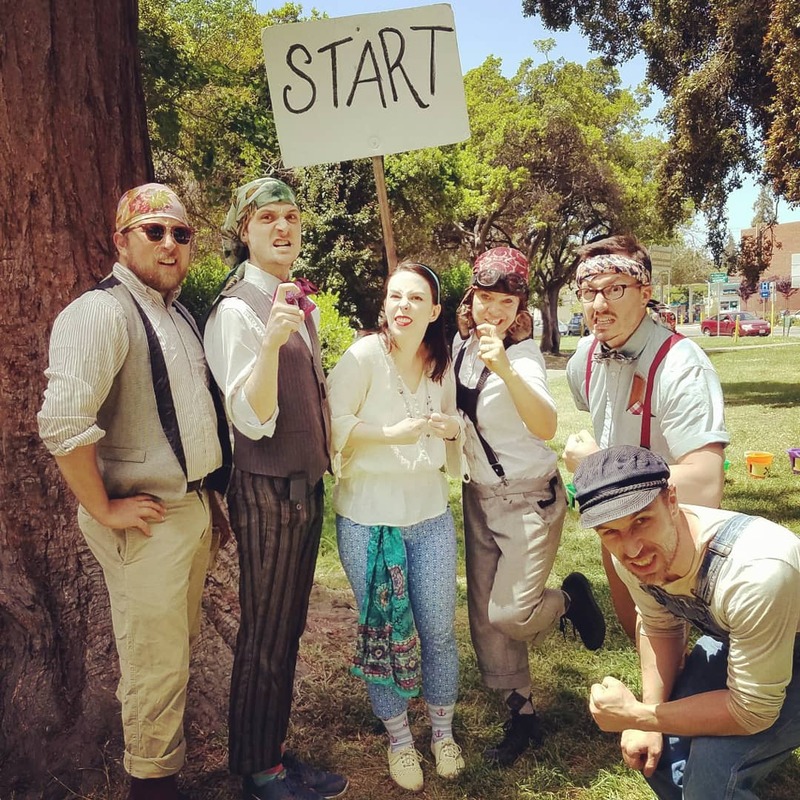 The Samuel Peaches Peripatetic Players are happy to report that they all managed to complete 16 obstacles in the Third Annual Particularly Obstinate Obstacle Course (POOC)! Held Saturday, May 19th in the year 2018, the POOC was a rousing success! The Skeleton Pirate was decimated by Pirate Gwen, Pirate Stephanie, Pirate Thumper, and Pirate Guy! Our very own treasure map! 1. The Pledge of Arrlegiance! 9. The Kraken! 8. Pirate Puns 16. Time Fer Treasure! 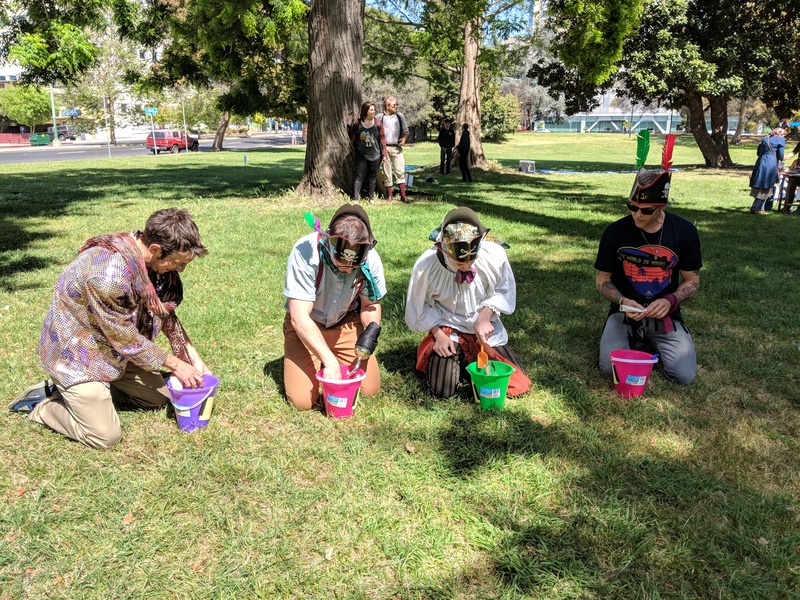 Thank you so much to all of our friends who joined us in Mosswood Park — it wouldn’t have been nearly as much fun without you! Becoming a pirate starts with a hat. If you get lost, go here! 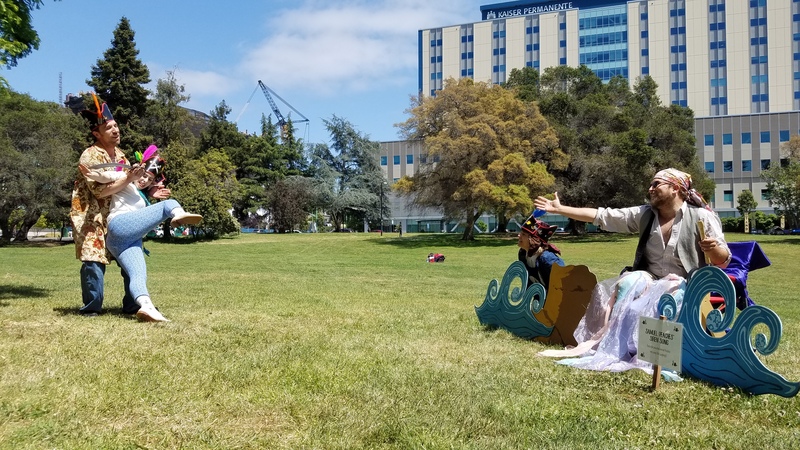 There is still time to donate, if you’d like to help us bring FREE theatre to Bay Area parks and public spaces; donations made now through July 15th will be DOUBLED through our Matching Grant from the Easy Bay Fund For Artists.